I'm still somewhat baffled by the new animated film Wonder Park, because to me the whole thing about a girl who discovers a functioning amusement park run by animals and populated by thousands of human attendees seems super creepy. That the park is overrun later by a bunch of zombie chimpanzees is perhaps the least disturbing aspect. The latest trailer doesn't ease my mind in the least, but at least it looks pretty? The film features the voices of John Oliver, Jennifer Garner, Kenan Thompson, Matthew Broderick, Mila Kunis, and many more. You may recall some controversy when director Dylan Brown was fired over inappropriate behavior on set, and replaced by a trio of co-directors you've never heard of. It looks like a wild ride, though, which I guess we should expect with a script by Mission: Impossible-Ghost Protocol duo Josh Appelbaum and Andre Nemec. 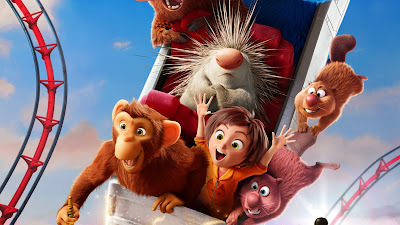 Wonder Park opens March 15th, and will be followed by a TV series to hit Nickelodeon some time this year.